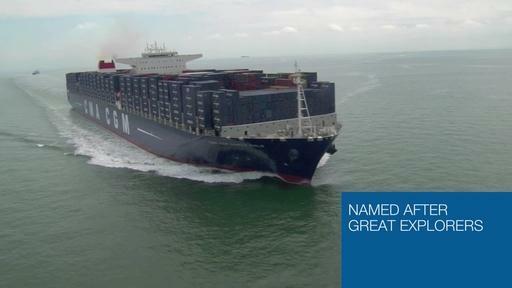 The CMA CGM MARCO POLO is the largest container ship in the world. It is 396 meters long and can theorically carry up to 16,000 containers. But are all these containers travelling on the ship similar? No, they are not ! Though some containers might look the same from the outside, they are very different. And it’s not only size and color that differentiates them. Bamboo-flooring eco-containers: in 2005, CMA CGM was the first shipping group to develop and invest in innovative bamboo-floor containers which meet two objectives: to minimize the use of wood from valuable primary forest while improving the container’s technical qualities. Today, the Group has completed the purchase of 50,000 bamboo containers of which 25,000 are “Light Steel” containers. Light Steel containers: in 2008, the Group started a new venture when it introduced the first light steel containers to its fleet. This generation is made from strong, resistant high tensile steel which saves 550kg on a High-Cube’s tare weight without compromising its structural qualities. Low energy reefer: CMA CGM has 26,000 reefers (specialized containers for perishable products, requiring an energy source and refrigerants) equipped with lower energy motors, reducing electricity and fuel consumption by up to three times. Eko-Flor containers: there is no wood in the flooring of these containers. The flooring is made of a synthetic resin that offers numerous advantages, not least the fact it is lighter, saving on energy to transport the container, and is totally resistant to all types of products (water, oil, odours, microbes, etc. ).